The No Dig Garden is built on top of the ground, so you can start building a vegetable garden anywhere. This is natural organic gardening at its simplest and best. Preparing a vegetable garden of this sort is extremely attractive for those sites that have poor soil or invasive weeds. It's also a great way to build a garden for those that can't, or don't want to, dig a good size vegetable garden! Follow the natural gardening no dig diagram below, but first thing of course is to choose the site. Make sure it is roughly level and ideally most of the area gets at least 5 hours of sun a day. If it's not as level as you'd like it, roughly smooth out the humps and bumps, then fill the gaps and any lower edges with soil, sand or whatever organic material is at hand, such as bark, leaves, twigs, washed seaweed, paper, jute, wool carpet or similar. As this rots down, you will need to add more compost to these low areas and gradually build them up. If the ground is on too much of a slope, build some terraces for easy maintenance. Get your creative juices flowing... you can make a grand affair with formal retaining walls or just shore levels up with branches, bricks, rocks, planks, corrugated iron or other obtainable materials. When preparing soil for your vegetable garden and it is over lawn or weeds, you can mow the area to ground level and build the garden on top, or you can leave the vegetation to decay underneath in time — as long as you cut out light to kill off the grass and weeds underneath. If you are building a vegetable garden on a hard surface, such as dry clay, an old stony yard or driveway, put down a cushioning organic layer first (as above; bark, leaves or other dried carbon material). Here's a guide following natural gardening basics. It is only a guide remember, and your circumstances may be such that making a vegetable garden exactly the same would be difficult. You want an easy to build veggie plot, in fact any plot, so don't go blowing a gasket trying to find this and that, or putting this on top of that. It's worth reading about Lasagna Gardening to show you how to throw out the manual for building a vegetable garden. But back to the main guidelines: Begin with a newspaper layer of at least 5 pages — or 20 or so pages if you like (or packing, wrapping paper, cardboard, sacking, natural carpet etc) to at least 5mm (¼ inch) thick. Give it a good soak of water. 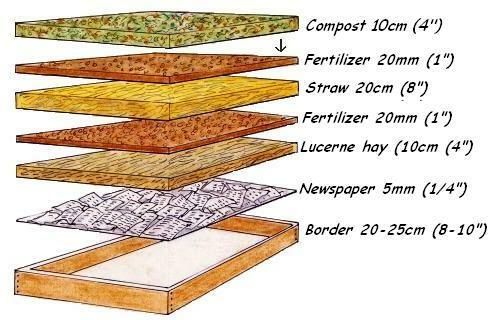 If you have those really tenacious, weedy dudes such as onion weed, couch or buffalo grass, docks, convolvulus, thistle, bindweed, ivy and other nasties, definitely put down a strong first layer such as well overlapping cardboard or at least 20 plus layers of newspaper. It helps to surround the garden with some sort of border material. This can be bricks, logs, planks or rocks and can be 20-25cm high (8-10 inches) or more. See these fabulous ideas here: Ways to contain raised garden beds. A raised border contains the organic material within, discourages invasion of surrounding lawn or weeds, deters various people and critters, and means less back-bending. Lay down a layer of pads of lucerne hay (alfalfa) leaving no gaps, to a height of 10cm (4 inches). Layer some good organic fertilizer on top to a height of roughly 20mm (1 inch). This can be just about any sort of good quality material like well rotted chicken, horse, cow or sheep manure. If you don't have this sort of material available, sprinkle a layer of good natural commercial fertilizer. No need to go the full 1" depth with commercial material. Add a thick layer of loose straw to the garden 20cm (8 inches) and another layer of fertilizer and then top it off with 10cm (4 inches) of compost. Water the garden until it's wet but not soaking. You can now start planting your seedlings immediately for an instant garden! Here's a diagram of the process when starting a vegetable garden the no dig way. This is the flawless film star version... the real deal will NOT look neat like this! You also do NOT have to have these exact layers, materials and quantities. Nature does not use a tape measure — use whatever you have at hand or can easily buy. Building a vegetable garden like this (seriously messier than these pictures) can be achieved in a couple of hours if you have the materials on hand. Build several garden beds in different shapes to add interest and variety to your gardening. A bale of lucerne and a bale of straw will spread over a garden about 2m by 1.5m. If you have a reasonable growing season, get one plot underway and start the second later. No dig gardens are just the same as other gardens... just easier to build and maintain. Here are some step-by-step photos of building a no dig garden using a slightly different approach. Satisfying isn't it? Aren't you clever... that wasn't too hard I bet. Welcome to the world of sustainable living and nature's way to live, love and garden.